Wildfires have been ravishing the American west lately and no one is working harder these days than the crews set out to battle the blazes. Tragically, three firefighters lost their lives fighting the flames in Washington when it appears the vehicle they were riding in fell down a 40-foot embankment. In Portland, Oregon nearby fires have been so bad, residents have widely reported irritated eyes and sinuses. 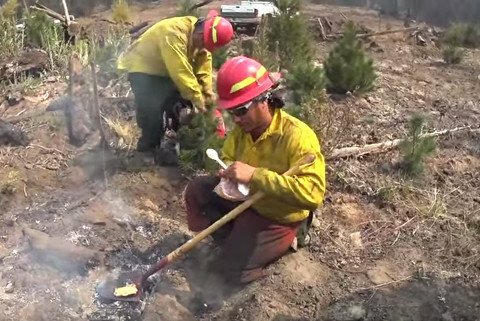 One fire crew found a way to relieve stress and get a hot meal in the field by turning a shovel into a frying pan. All you need is a shovel and a healthy ground fire, which was certainly plentiful in these parts. Watch as this fire fighter grills a burrito with a little mayonnaise to act as oil.